Once again, Concert TV brings the best in music programming to a TV in your home. The featured title this month is Madonna’s 2013 release, MDNA World Tour. But Concert TV doesn’t stop there. In celebration of the recent ACM Awards, April’s concert videos include sets from Keith Urban and Jason Aldean. BendBroadband introduced Concert TV to its viewers last December. Already the network has presented a long line of top artists performing at the top of their game, including Led Zeppelin and Paul McCartney. This month, the spotlight shines on Madonna, the best-selling female recording artist of all time. The Material Girl has sold over 300 million records worldwide and is still going strong. The April concert video highlight is the blockbuster “MDNA World Tour.” Featuring 88 sold-out shows in 29 countries, the tour was the most successful concert tour of 2012. The show has been described as a two-hour joyride. Madonna herself spent six months editing footage shot with 30 cameras during 80 shows. Concert TV also is turning the spotlight on country music this month. With the recent 2014 Academy of Country Music awards still fresh in our minds, the network is featuring selected concert videos from Jason Aldean and Keith Urban. Urban, who was nominated for Male Vocalist of the Year, shines in “Love, Pain & the Whole Crazy World Tour.” The concert video features “Once in a Lifetime,” “Where the Blacktop Ends,” “You Look Good in My Shirt” and many more hits. In addition to the spotlight features, Concert TV is offering up a wide array of videos, including “Certifiable in Buenos Aires” by the Police; “Cypress Hill Presents Smoke Out” featuring Snoop Dog and other artists, and Alice Cooper’s “Live at Montreux 2005.”. Check out these concert videos and many more on BendBroadband VOD. Most videos are available on demand for at least two months. Access to the VOD contents is easy: Hit the VOD button or key in 999 on your remote, and then select the “Music” category. 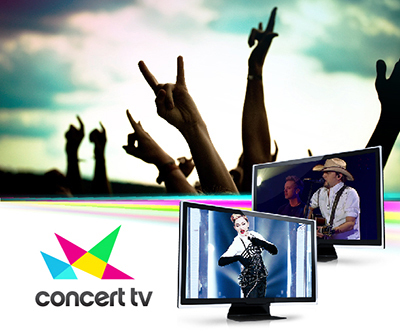 The on-demand Concert TV videos range from $2.99 to $3.99.